Our Mission: To provide resources for Optimal Housing, Health, and Education. We serve as a catalyst for sustainable change within the lives of those we serve by ensuring that their fundamental Housing, Health, and Educational needs are met. Make It Count envisions a world where all people have the best opportunity to realize their maximum potential. Make It Count realizes its mission through the development and implementation of dynamic programs as well as strategic partnerships with leading nonprofits and community organizations. Make It Count recognizes that in order for an individual to reach his or her maximum potential, a synergy of 3 critical elements – Housing, Health, and Education – must not only be met but also nurtured. Addressing this synergy enables children, youth and their families to develop into competent, confident and compassionate individuals with the power to make a difference in their world and beyond. Make It Count believes not only that all human beings are entitled to the basic necessities of life, but also that all people should have an opportunity to make every moment of their life count. 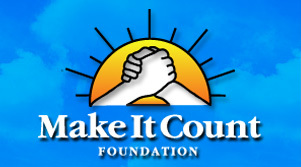 By providing individuals with fundamental resources needed for physical and emotional stability, the Make It Count Foundation transforms lives now, enabling those we influence to achieve their own personal potential and in turn, help others do the same. Make It Count believes that “to give is to receive”. Those who are able to provide these valuable resources enrich their own lives in the process of helping those we serve, becoming themselves a critical ingredient in the harmony that creates powerful moments that count. Meaningful moments are a measure of a life well lived.